When a Seattle Police officer tried to pull over the car of a suspect who was wanted on a warrant, the driver sped off, then crashed into two parked cars and one car with a driver inside. “The car was barreling down this hill, (hit two cars) and Pow!" a witness to the accident told reporters. Three people got out of the suspect’s car and tried to run; two were arrested. According to the Seattle Police, the officer who initially tried to pull over the suspect’s car did not give chase. A crash involving two pickup trucks and a semi-truck closed State Route 18 near Snoqualmie. Investigators found that the crash began when a pickup truck braked for a traffic slowdown and the driver of the semi-truck behind it did not brake. The semi-truck slammed into the pickup, pushing it across the center line into the westbound lane, where it was struck by a second pickup truck. The driver of the second pickup truck was taken to Harborview Medical Center in Seattle with serious injuries. The drivers of the other two trucks were transported to Overlake Hospital in Bellevue for treatment of their injuries. Two people had to be rescued from a car that fell 150 feet down a cliff at Point Defiance Park. The elderly victims of the crash were trapped in their car for an hour and a half before crews rappelled down the hillside to free them from the wreckage, then lowered them down a waterfront cliff to a fire boat, which transported them to a hospital. A 55-year-old pedestrian who was walking along the side of U.S. Highway 101 was struck and killed by a vehicle on Friday night. Washington State Patrol troopers had spoken to the victim shortly before his death when they found him walking along the highway in an apparent state of distress. They observed that the pedestrian had a concerned friend who was following him in a pickup truck; the victim had gotten into a fight with his wife and had taken off walking despite his friend’s invitation to get into the truck for safety. The man was wearing dark clothing and was apparently difficult for the driver of an oncoming minivan to see. 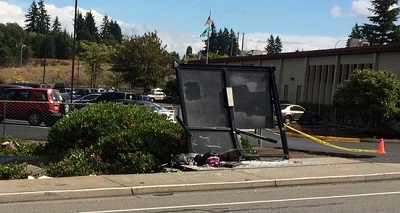 A man from Idaho was arrested after he crashed his car into a bus stop in Bremerton, striking a woman and a man who were waiting there. The woman died after being airlifted to Harborview Medical Center, and the man was transported to a Tacoma hospital in critical condition. The driver admitted to police that he had used marijuana and methamphetamine before the crash. A U.S. Marine Corps veteran was driving with his brother on state Route 512 near Tacoma when an aggressive driver clipped their car. The victims followed the aggressive driver, who ended up running the brothers off the road. When the veteran got out of his car, the aggressive driver put his car into reverse, backed into him at high speed, and then fled the scene. The victim’s leg was severed; the lower part of his leg had to be amputated at a local hospital. A man named Jeffrey Giblin later turned himself into police and is facing multiple charges. The driver of a vehicle died in a single-car crash early Saturday morning near North Bend. The accident happened on Interstate 90 near State Route 202. All lanes of westbound I-90 were closed, causing a traffic backup; a woman who went into labor while in she was stuck in the traffic backup was escorted to the hospital by officials. A woman who was walking near Ravenna Park in Seattle was struck by a van. She was transported to Harborview Medical Center with critical injuries. Police arrested the driver of the van after evaluating him for signs of possible alcohol or drug use and finding signs of impairment. A driver who was traveling in the wrong lane of Highway 18 collided with two other vehicles on Tuesday night. The driver who had gone the wrong was James Porter, 62, of Seattle; he had been traveling west in the eastbound lanes before the crash. Five other people were injured, including three your children. The Washington State Patrol does not believe that drugs or alcohol were factors in the crash; they believe that the driver was disoriented or went the wrong way because he was unfamiliar with the area. An 11-year-old girl is in critical condition at Harborview Medical center after she was struck by a car outside her Auburn elementary school. The teenaged driver who struck the girl is a neighbor od the family; the girl’s mother told reporters, “She (the driver) said that she just didn't see Illa, and we totally believe that… There were no drugs or alcohol, she was not on her phone, nothing.” The stretch of road where the girl was struck is known to be dangerous at certain times of the year, when the rising sun can blind drivers and pedestrians traveling on a hill with limited visibility. A 69-year-old Bonney Lake man was found bloodied and bruised, with a broken jaw and eye socket, after he was assaulted while walking home from a local gym. The man doesn’t remember many details of the attack, but before he was assaulted he noticed a light-colored truck following his vehicle. He remembers that multiple men attacked him and that one of them was holding something in his hand; his family suspects that the assailants pulled him out of his vehicle and beat him during a road rage incident.